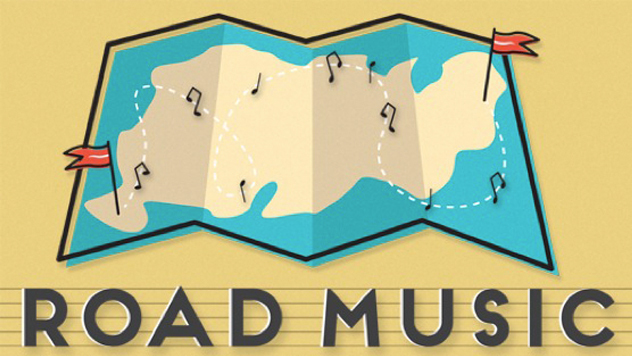 For this series, we’ll be following Paste’s own Curmudgeon, Geoffrey Himes, as he sets out on a massive road trip across the South, exploring musical landmarks, traditions and history along the way. Eighth stop: Port Aransas, TX. Travel by car connects the dots in a way that air travel never can. Sure, driving long distances is slower and not really cheaper than flying, if you factor in motels and meals, but a road trip gives you a feel for the way the landscape alters mile by mile. It allows you to size up each piece of the puzzle and how it fits with the next. As I drove south on I-55 through Mississippi on February 21, I could feel the countryside changing. The flat cotton fields of the Delta gave way to the wooded hills that cover most the state. I’m always surprised to be reminded how empty Mississippi and Alabama are. You expect Western states such as Wyoming and Utah to be sparsely populated, but you don’t expect it in the more crowded East. But I often drove for miles through Mississippi without seeing a building—and then many miles more before seeing a second one. But as I crossed the Louisiana border, the land flattened out again, filled with ponds, swamps and bayous. The white, snake-like shape of the great egrets could be spotted pecking at fish at the water’s edge. Entering Louisiana is almost like leaving the United States and arriving in a Caribbean nation. The vegetation is sub-tropical—palmettos spread their spiky fans here and there; cypress knees push up through the water, and Spanish moss drips from the live oak trees. The architecture is more French, the soil more soggy. The animal life is different—you almost never see wild alligators in the U.S. more than 50 miles from the Gulf of Mexico. The air itself is different—heavier with all its additional moisture. Such surroundings inevitably shape human behavior. Everything’s less efficient and more sensual. It can take forever to get your food served, but when that oyster po-boy comes, it will be the best sandwich you ever tasted. The band may not play a million notes a minute, but the trumpeter or fiddler will fill each note with as much flavor as it can hold. It’s hard to glimpse this connection in New Orleans’ French Quarter, throughout the city are glimpses into the habitat that inspired the culture. Right in the middle of New Orleans is Audubon Park, and right in the middle of the park is Bird Island, which offers some of the best bird watching in the state. Crowded along the bayou that cuts through the park are snowy ibises and roseate spoonbills, birds that one never sees in the Northeast and Mid-Atlantic. The black-bellied whistling duck, a stunning bird with a neon-orange bill and a black mohawk running down his gray head, is a Mexican bird that has taken up permanent residence in New Orleans in recent years. That was another theme of this trip—the early arrival of spring. February saw t-shirt weather in Kansas City, azaleas blooming in New Orleans and blue bonnets blooming in Houston—all two or three weeks earlier than normal. You can’t say that climate change is responsible for any one weather event, but you can safely say that man-made warming has made such events more frequent and more intense. And while the early spring was a boon for a February traveler, it was probably a harbinger of a hellish summer to come. Much of the Gulf Coast didn’t have a really hard freeze this past winter, and a lot of vegetation that usually dies off in January was still thriving. When my friend Julianna and I visited Jean Lafitte National Park in Barataria, Louisiana, the natural bayous and man-made canals were choked with water hyacinth, a fast-spreading invasive species. On the other hand, the alligators were thriving as well. We saw 12 alligators on our walk—the highest total in 32 years of hiking the Palmetto Trail and the Bayou Coquille Trail. Many of them were youngsters, an indication that the warming climate has also encouraged reptile propagation. Though gators can move surprisingly fast when provoked or hungry, these specimens were digesting their food in the sun, with no desire to move more than a foot or two in any direction. Contrary to how they’re depicted in cartoons, logos and illustrations, alligators are not green. The young are gray, and the adults are a dark black, which makes the armored ridges running from their eyebrows to their tail tips look all the more antediluvian in the sun-glazed water. They look more like dinosaurs or dragons from a natural history museum or fantasy film than creatures of our own time period. I never get tired of watching them. The day after Mardi Gras, I headed west towards Texas, passing all the farms with square, shallow ponds that combine rice farming and crawfish. Than small flat-bottom boats propped on the bank are for pulling the mudbugs out of the lantern-sized wire traps that float in rows in each pond. I stopped along the way at the Sabine National Wildlife Refuge near Hackberry, Louisiana, home of the great Cajun band the Hackberry Ramblers. Within the refuge is preserved the landscape that gave rise to that music in the 1930s. Flocks of black-winged blackbirds leapt from shrub to shrub ahead of me as I walked the trail. A young gator curled in the brittle winter reeds, and three roseate spoonbills flew overhead. The soil was soggy just off the trail, just like the local music that seems to slide around the beat and the melody in dizzying delight. I picked up my wife Liz at the Houston Airport and we drove down to Port Aransas, Texas, on Mustang Island. We took the ferry to the town and found our hotel, Amelia’s Landing, where every room had a different aviation theme—we were in the Wright Brothers Room—and a continental breakfast was delivered to your door each morning. This was the week before the Texas schools went on spring break, so it was like the eerie calm before the hurricane lands: it was easy to get tables at restaurants, but hand trucks full of beer cases were being rolled into each kitchen. But every place we went, the seafood was terrific. Most of the town seems trapped in the 1950s with small bungalow homes, modest motels and wood-frame restaurants—the high-rise hotels and condos that ruin most beach communities have been pushed to the edge of town. This time-capsule feel is enforced by the inconvenience of the ferry and by the ugly presence of three giant oil rigs parked by the ferry dock. But this lack of progress has allowed four splendid birding sites to flourish right in town with many more a short drive away. The bird watching was spectacular. In Port Aransas itself, I saw white-tailed hawks, reddish egrets, a clapper rail and a horned lark for the first time. At the San Padre Island National Seashore, I saw an aplomado falcon, a black-bellied plover and an American kestrel. At the Aransas National Wildlife Refuge, the most remote and most rewarding spot of all, I saw a giant whooping crane at the far side of a lake and a black rail in a slough near two swimming alligators. The Gulf Coast of Texas is so different from the standard view of Texas that it’s hard to believe it’s part of the same state. It’s green and wet, while most of the state is brown and dry; it’s more like Louisiana than it’s like any part of Texas north of Livingston or west of Victoria. The music is different too. The Zydeco Belt runs from Lafayette to Houston, and the slippery syncopation of swamp-pop and New Orleans funk can be heard in the great R&B singles from Houston’s Duke-Peacock Records. After four nights on the barrier islands, I returned Liz to the Houston Airport so she could return to grad school. But I stayed over in Houston a few more days to savor the humid music and spicy food that links that city to New Orleans. Both towns are sliced through by lushly green bayous and canals; both boast remarkable folk art and nightclubs where people are eager to dance. It’s a different world from the rest of the South, from the rest of the nation. It’s a showcase for the lubricating effects of moisture on music, food and social interaction.